The Exploration Club finally stepped foot upon the snowy plains. With all their snowy mountain gear equipped, they looked completely different from when they first arrived. Even a short walk made them feel hot and stuffy with the fasteners of their parkas zipped all the way up. A short while after departing Subaru’s castle and setting off on the roadway, Yukiwarimaru and the other wolves came to see them off from atop the mountain ridge. There were several smaller young wolves amidst the gathering of large grey wolves. Unable to resist their curiosity, the young wolves leapt out from the pack to gaze at the club members. At their forefront was a young white cub. Ameno looked up at the wolves in a nervous manner. Hatsuyuki had grown quite a lot since they last saw him. Before, he’d been the size of a small Mameshiba dog, but now he was as big as a regular dog. He was no longer a fledgling cub. Looking back at Homura, Ameno smiled bashfully. Hatsuyuki and the other young wolves chased after the club members while maintaining a set distance between them. When they finally made it past the edge of the valley, the wolves stopped and turned back. Only Hatsuyuki stayed to keep watching them. As she walked at the tail end of the group, Ameno turned around countless times and waved at Hatsuyuki, clearly reluctant to part. For the first few days, there was no snowfall and it was quite an easy journey. Homura’s body seemed to gradually adjust to the march through the snow. At first she felt terrible muscle pain from using different muscles from regular mountain hiking, but she eventually got used to it and became able to walk at her own pace without tiring. It was also fortunate that they weren’t passing through deep fresh snow that would have required them to physically plow through it with their whole bodies. In any other season, the fallen leaves and branches from the forest of conifers would have obstructed their progress, but thanks to the snow the path was wide and easy to traverse. It was the stiff and frozen snow surface along the shadowed slopes that made Homura the most nervous. Even the spikes of their snowshoes, made of an advanced aluminum alloy, couldn’t pierce through the snow and they easily slid back down for every little bit of headway they made upwards. Naturally, this called for the use of the trekking poles to support their bodies and the claw-like steel climbing spikes attached to their boots, which may just be their greatest weapon on this particular mission. Homura posed theatrically with her climbing spikes in each hand while Ameno mimicked her shout with a smile. “Double heavy climbing spikes! !” Kamikoma-senpai shouted, holding up climbing spikes she’d stolen from Taga while he’d been putting them on. The huge spikes looked like terrifying weapons. Taga wore a troubled expression next to her. Homura managed to clear the slope using the climbing spikes with little difficulty—she only fell over two or three times—thanks to that despica… no, wonderful snow gorilla instructor. Remembering that grinning face that resembled an over-grilled steak each time his training bore fruit really pissed Homura off, but she still had to thank him for everything he’d taught her. Unlike most of the others, Saho didn’t seem to find the mountain climb through the snow strenuous at all. He agilely skipped across the snow as if he weighed nothing at all. And he was always chatting away every day and night about the animals, animal tracks and even animal feces they encountered along the way, identifying the creatures with unabating excitement. When the group stopped to debate whether to cross or go around a ridge, he eagerly ran ahead to check out the terrain first before they could come to a decision. At first Misasagi and Touya tried to accompany him for the sake of safety, but Saho didn’t listen and ran off so fast they couldn’t follow. That quick and agile figure of his reminded Homura of the nimbleness Inari had displayed on the uninhabited island. …Meanwhile, Homura’s interest was focused on Kanae Yuri. Kanae didn’t seem to be in good condition on this expedition. She carried much less baggage than the others and walked at the center of the party’s formation. In truth, the party had to adjust to Kanae’s pace as they advanced. However, this wasn’t due to any ailment, but instead was related to a physical change that occurred to her on Nutella. It was an unavoidable physiological phenomenon similar to transport sickness and no one blamed her for it… or so Homura liked to believe, but she could tell that Kanae felt bad about it. It was precisely because Homura herself had once been in a similar position that burdened the group that she knew that the occasional murmurs of “Looks like we’re falling behind schedule” and “It’d be safer to go around this slope” from Kamikoma and the others pierced Kanae’s heart. Misasagi, who was in charge of the rear section of the party formation, was also concerned for Kanae. During one of their rest breaks, Homura couldn’t hold back any more and walked over to the heavy-breathing Kanae. “Yuri-chan… Are you okay? Are your feet all right…?” Homura asked out of concern. Her brow covered in sweat, Kanae gave Homura a harsh glare, but still managed to nod. She really did seem to be pushing herself hard. Homura recalled Hayase Ryou’s face right before they departed. Unlike his usual easygoing self, he had been silent and worn a long face. But when Homura had noticed that and locked gazes with him, he’d said nothing. He’d merely given her a small smile. For this mission, the backup team of Hayase and Momoyama would be waiting on standby at Seiran High instead of their own school Hiyoshizaka High. They went to Hiyoshizaka High for their daytime lessons and spent the rest of the time in the club building at Seiran High, even sleeping there in order to remain ready at all times. 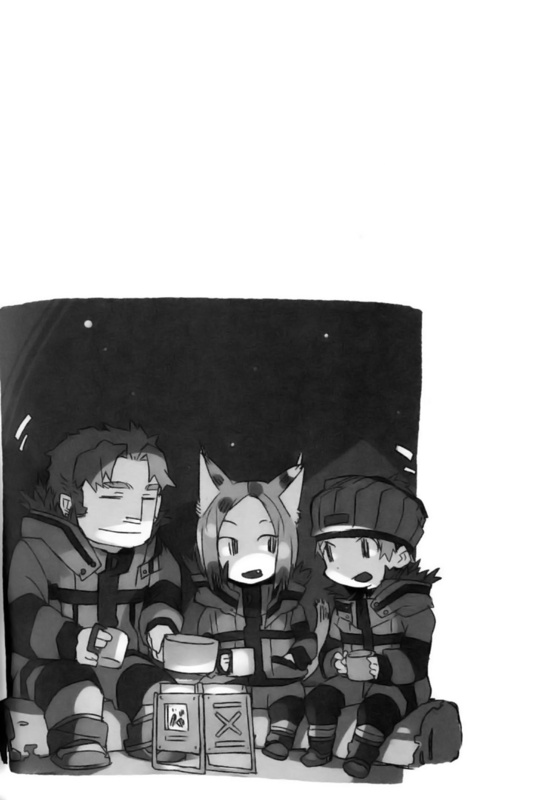 This was because Seiran’s base camp was closer to their expedition than Hiyoshizaka’s. Yuri-chan doesn’t have Hayashi-senpai by her side like she usually does… huh…? Perhaps as a result of that, Homura might have felt a bit protective of Kanae. Immediately afterwards, Kanae yelled angrily at Homura, and the other party members turned to look at the commotion. Misasagi and the others looked at them worriedly, but Homura immediately stood up and made a self-deprecating joke with an apologetic bow. Saho, who’d been nearby, conveniently played along and harshly scolded Homura to make it look as if Homura had teased and angered Kanae. Furthermore, he even added that Kanae was at fault too for not getting the joke, causing the scolding from everyone to get redirected at Saho himself and preventing the matter from getting any further out of hand. Homura fervently thanked Saho afterwards. The whole thing honestly made Homura begin to think that he wasn’t as stupid and thoughtless as he seemed. —That night in the tent Homura shared with Misasagi and Ameno. As Homura tried to sleep in her sleeping bag, the words that Kanae had directed at her with a voice more sharp and piercing than climbing spikes resounded in her heart. The morning of the third day of their journey, in the camp they had set up in a forest on level ground. Homura hadn’t slept well. She relieved her dry throat with the water canteen she’d kept inside her sleeping bag and then crawled out of the tent, but there, she encountered someone completely unexpected. Taga, who had woken up early, was drinking coffee in front of the campfire along with a familiar princess in a kimono. That’s the campfire we worked hard to make last night, Homura thought absentmindedly, before finally realizing what was out of place. Subaru gave the cup back to Taga while expressing her thanks for the courtesy of pouring the drink for her. “Yo,” greeted Taga as he accepted the cup and nodded disappointedly at Subaru’s refusal of the drink. Subaru adjusted the thin white robe over her usual kimono. Her feet were covered by what looked like fur boots. “…I saw a bad dream,” Subaru answered nonchalantly. The whole situation made Homura feel like she was the one seeing a dream. She looked around and saw Yukiwarimaru lying down a little farther away on top of the snow. There, Saho and Touya, who had apparently woken up early too, were crouching in front of Yukiwarimaru and trying to give the wolf some fresh food (a squirrel, or maybe a weasel?) that they must have caught in the forest. The wolf was eating it, though. Almost resembling a snow hut atop the snowy plains, Yukiwarimaru had what looked like a soft pelt saddle attached to her back. She also had something resembling short winter stockings on her paws. A small bamboo trunk containing Subaru’s luggage and a woven straw hat lay on the ground next to the wolf. Subaru had come so lightly packed that it made the enormous piles of equipment that Homura and the others brought seem ridiculous by comparison. Furthermore, a bit farther away, Ameno was shyly stealing glances at Yukiwarimaru while preparing breakfast for the others. Despite being aware of Ameno’s presence, Yukiwarimaru remained calm and docile. —Eventually, the party packed up the tents and resumed their journey. Subaru followed along next to their marching formation. She gave off an air of composure as she sat sideways on top of Yukiwarimaru, her hair glittering beneath the sunlight filtering through the tree branches above. She exuded a beauty that resembled a Japanese painting sprinkled with gold dust. Combined with her old-fashioned umbrella and white kimono, she was the very picture of a beautiful bride off to be wed.
Homura and even Saho at the front of the formation watched her in fascination. With that murmur from Subaru, Yukiwarimaru came to a stop. The rest of the party also stopped and looked over at her. Subaru murmured as she gazed at the forest ahead. She sat timidly on top of Yukiwarimaru, as if she could sense an invisible wall in front of her. “Geez, I don’t know what kind of foreboding you’re feeling, but could you please not raise any unlucky flags? How about you head back before you catch a cold?” jeered Saho. Usually, Subaru would just snort at such frivolous words, but her response was different this time. Subaru turned Yukiwarimaru around, but then suddenly seemed to think of something and got off the wolf, walking over to Misasagi. In a half-forceful manner, Subaru handed Misasagi a spirit stone. It was the ‘stone of power’ that Subaru always carried on her person. Misasagi was flabbergasted by Subaru’s attitude, which seemed to be spurred by something unknown. The Exploration Club members naturally understood how precious spirit stones were. And also how much Subaru treasured this one. It was something far too important to be handed over as a mere protective charm. As the two of them argued with few but firm words, someone spoke up. That earnest request came from Kanae Yuri. Kamikoma’s chiding tone was harsh. “Hey, Yuri-chan, what’s gotten into you?” asked Saho with a perplexed stare. In the end, Subaru gave up on giving the stone to Misasagi and bowed her head to everyone before departing. Homura, who’d been holding her breath at the figurative bloodshed that nearly came about, patted her chest in relief. She had no clue why Kanae had suddenly said such a thing. Subaru walked back to the waiting Yukiwarimaru. But just as she passed by Homura, Subaru forcefully handed her something without anyone else noticing. Homura was filled with shock at the hard sensation she felt through her gloves. Eeeeeeeh…!? Wait a minute, S-Subaru-san!? Homura mentally screamed in utter confusion. However, she had no time to say anything, as Subaru climbed on top of Yukiwarimaru and gallantly dashed back down the path they came. Homura hastily shoved the item into her pocket, and only took it out again later once she was alone. Just as she’d thought, it was Subaru’s ‘stone of power’. Later that day in the afternoon, a strong wind blew. Fortunately, they’d yet to experience any heavy snowfall on this expedition, but the strong wind whipped up ice-like snow particles into the air which harshly barraged their goggles and parkas. According to Taga, a man of few words as always, this wind was proof that they were nearing the coastline. That night—the wind finally died down, and Kamikoma gathered everyone together in their campsite and discussed the current situation once more. Naturally, their training and experience played a large part in this, but the biggest contributing factor was that they’d managed to choose a route that was easy to travel across using the map they’d been provided. There had been a moment when Kamikoma had mistakenly tried to divert from their planned route, but Homura had noticed and pointed out her mistake in time. Her experience in the SA race had ended up bearing fruit. The party was aiming to reach a peninsula on the opposite shore of the coast they would arrive at tomorrow. “…What’s that supposed to mean? Are you planning to make a boat or something?” asked Homura with a puzzled tilt of her head. She only recalled as far as when Subaru had said that the mountain range along the coast was steep and precipitous for the most part. Though it was only second-hand hearsay on her part, Subaru had explained how there was a ferry across the bay during summer, but in winter, travelers walked across the bay on foot to the other shore. “It’s as intermittent as a sea bridge linking two countries,” Subaru had joked. In this case, rather than a bridge at the national border like her nuance suggested, it was more like a ‘flow bridge’ that came and went with the seasons. Walking across the sea… Homura panicked as the reality of it finally started to sink in. “Yeah, I can’t deny that that risk exists!” affirmed Kamikoma. “You’re not denying it! ?” screeched Homura as she stiffened. Even Kamikoma could only speak with confidence to a point. “Yay!” shouted Homura, all her earlier unease forgotten. Kamikoma furiously grabbed Saho’s cat ears. The ‘secret weapon’ was in fact just a collapsible pool. It was their most prided tool that they’d received from the American investigators during their training in Alaska. It was light and sturdy, using the standard UNPIEP tent poles in its construction, and well-insulated so that it could even be used on top of snow. However, it was essentially a disposable apparatus meant to be thrown away after use. After gathering large amounts of Touhi (a species of Yezo spruce) branches from the surrounding forest, they lit a fire and heated up the bathwater supplied though melted snow scooped up using all their pots on hand. They set up a cylindrical pool fence on top of finely-treaded snow and poured in the bathwater, which had already begun to steam. The bath’s maximum capacity was three people and was spacious enough that two people could stretch their legs leisurely within it. However, naturally, the water temperature would quickly cool in this weather, so they had to keep resupplying hot water. As such, each member’s bath time was kept to a minimum. After Kamikoma said that, Homura headed to the bath first. There was a jumbled debate within the Hiyoshizaka girls’ tent after that, but eventually, Kanae came out of the tent to join her in the bath. Kamikoma turned off the lanterns and apparently headed off to the Seiran girls’ tent. The boys’ tent was further away within the shadows of the trees, so it was tentatively safe, for now. For now. Yes, for now. Homura’s teeth chattered at the sub-zero cold air as she removed her many layers of clothing. After quickly washing down her body outside, Homura leapt over the fence which was surrounded by steam. The improvised bathtub was tall enough that the water came up to her neck when she sat down. She finally felt relaxed as she sunk into the numbingly hot water. However, now she didn’t have any means to wash her hair. That was the main point of taking a bath to Homura, so the realization hit her hard. Moreover, the time limit of her stay in the bath was approaching moment by moment. If she tried washing it like normal, the precious bath would be filled with foam and bubbles. But at the same time, she was tired of using ‘shampoo that didn’t need water’ all the time. Kanae, who entered the bathtub shortly after, sighed at Homura’s mundane worry. “Why don’t you just stick your head out of the bath and wash it like that…? I’ll wash away the shampoo for you once your done,” proposed Kanae with an exasperated expression. “—No, no, we can’t have that!” Homura frantically began to wash her hair. She took out her small portion of shampoo from her pouch next to the bathtub and forcefully handed some to Kanae as well. As they washed their respective hair with not a single piece of clothing on either of their persons, Homura was filled with emotions she had trouble putting into words. Within her clothes to the side was Subaru’s spirit stone. And Kanae was unaware of this. Out of a desperate desire to get rid of the silence between, Homura asked a question. “I doubt any of us would make it home alive if we did that,” replied Kanae. The majority of investigators experienced an improvement in their physical abilities on Nutella. Kanae was apparently one of the few exceptions. Neither Kanae nor Homura had much confidence in their stamina. Yet, Kanae had gone through the same training in Alaska as Homura. With those factors in mind, the differences between them came down to the strengths and weaknesses of their constitutions on Nutella. The splash of hot water directed at Homura’s face was apparently Kanae’s way of giving consent. They conversed like this as they washed their hair, and then sunk back into the bath once they finished. There was something that Homura had to ask Kanae in the short remaining time before they returned to their separate tents. After firming her resolve, Homura spoke up. Silence reigned between them for a while after that. Kanae’s words held the same kind of sarcastic tone as Kujou-san’s did when she was unhappy. The cold air clung to their washed hair and gradually formed frost on them. While gazing at the nearby crackling campfire, Kanae finally spoke. Suddenly, Kanae stood up from the bath and gazed into the night forest without looking at anything in particular. The orange glow from the campfire reflected off her drenched tanned skin. Kanae’s tone was filled with unrest as she spoke. Those words, on their own, sounded like a wonderful thing. It would aid not just Homura’s club, but investigators throughout the world, and increase the safety margin of their activities by leaps and bounds. But Kanae spoke as if she dreaded it. Kanae hunched over and hung her head with her face scrunched up. Homura gulped at that unsettling word. Kanae hugged herself, not from the cold, but from the fear and anxiety she couldn’t hide. She exposed her body to the freezing air, as if being the only one wrapped in warmth here was a sin. Homura was unable to help herself and stood up as well. Homura reflexively grabbed Kanae’s hand, but her fingers were sharply shaken off. The Nutellan starscape peeked through the gaps among clouds hanging above. The Bagel was covered by the shadow of Nutella on its night side. It was a pitch-black space across the sky that blotted out the shining sea of stars. Homura felt like she was being sucked into the darkness as she stared at it. Eventually, it got too cold to remain standing with their upper bodies uncovered, so Kanae finally sat back down in the bathtub and Homura followed suit. Holding her knees and sinking down to her mouth in the now lukewarm water, Homura spoke up. That was most likely Kanae’s personal conjecture. It was doubtful that those were all the facts. But Homura understood what Kanae wanted to say. For an instant, Homura thought that Subaru might hold the key to resolving this entire issue. But was it really possible that Subaru possessed other Level 2 or Level 1 ‘stones of power’ like the one Homura currently held—a stone that Subaru deemed so precious she always kept it on her person? And even if she did have others, would she easily hand them over if it was for the sake of making an accurate and detailed map of Nutella…? Wouldn’t that be an act that revealed the place that the People of Sagacity went to, a topic which she always avoided touching upon? Homura recalled the words Nanakubo had said before regarding the uninhabited island’s transport ring. ‘Pretend I lost it’… huh? Even if Homura coincidentally lost it, Subaru would have no cause to condemn her after forcing it upon her like that. Such thoughts crossed her mind momentarily, but Homura immediately came to her senses and shook her head. That would be no better than Kanae’s rash words earlier. No, it was an even more ugly and selfish act. Homura couldn’t do such a cruel thing. It would be no less than a betrayal towards Subaru. It was just about time for them to leave the bath. Even so, Homura felt like she had to ask Kanae one last thing. Both of them had noticed the small silhouette that came out from one of the tents. In an almost forlorn manner, Ameno walked over the snow in the darkness to the bathtub and called out to the two of them. “I guess you’re right… Wait, Taga-senpai is your bath partner? Isn’t that mixed bathing? Daddy won’t allow that!” said Homura, putting on airs of being her father. Homura and Kanae silently got out of the bath and redressed themselves. Just as Homura was about to return to the Seiran tent and tell the president and the others it was their turn, Ameno crept up and whispered to her. Homura grabbed Ameno’s shoulders and hugged her tightly from the side. True, her cheeks were cold, only warm enough not to instantly freeze any human who touched her in order to conserve her battery consumption. But even so, Homura still felt a faint warmth and smooth softness from the robot girl. The person who made her… is definitely a pervert, thought Homura in reaffirmation. (1) Midnight sun is the phenomenon where the sun remains out even at midnight in the summer months in places north of the Arctic Circle and south of the Antarctic Circle. Polar night is the exact opposite, when it remains night for more than 24 hours in those same regions. I’m sad to know that the next installation will be after 3 months! Good luck with your job!!! When is the next translation? Can you check if I missed any of the chapters? And can you please add new chapters there whenever you post them? They are one of the biggest community of readers who are definitely interested in your translations!